After we had completed an upgrade, a decision was made to separate the message server and enqueue (ASCS) from the PAS. If this had been a new installation of SAP NetWeaver 7.0x and higher rather than an upgrade, this would already have been done during the installation. 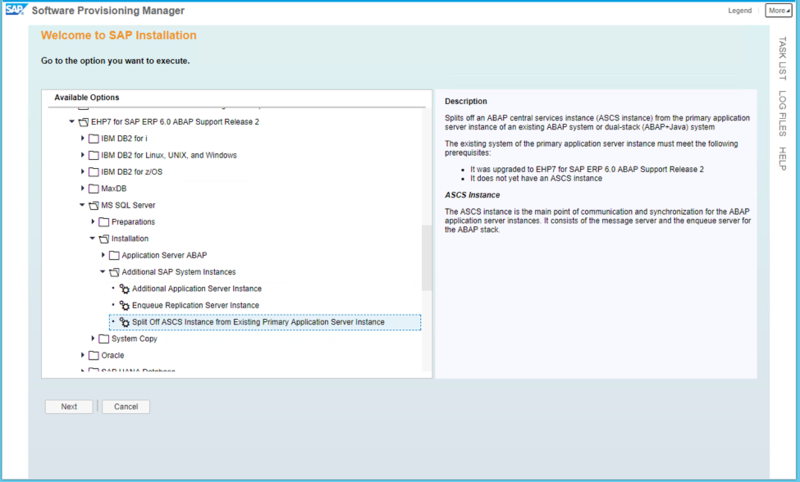 If SAP has been installed with NetWeaver 7.0 or lower, using 70SWPM, it doesn’t have the option available to split the ASCS. The only way to separate these would be to run a system copy and then split the PAS and the ASCS. SAP has provided a way to split these into two instances with SWPM for 7.1 and higher. I’ve outlined the procedure for splitting out the ASCS below. In this example, I used a Windows with NetWeaver 7.31 and Microsoft SQL Server. Splitting the ASCS option is available for every OS and DB combination. The benefits of this split would be performance and no more single point of failure. In addition, no more high number of enqueue requests in the request queue, work processes hanging while waiting or an answer from the enqueue process and high memory consumption of the enqueue work process. It’s not a temporary solution to migrate to a standalone enqueue server. SAP recommends using the standalone enqueue server as the better solution. The standalone enqueue server offers better performance and better scalability for large systems (two or more dialog/AAS instances). It is now the standard for all new installations. The illustration below shows the configuration after the ASCS split. 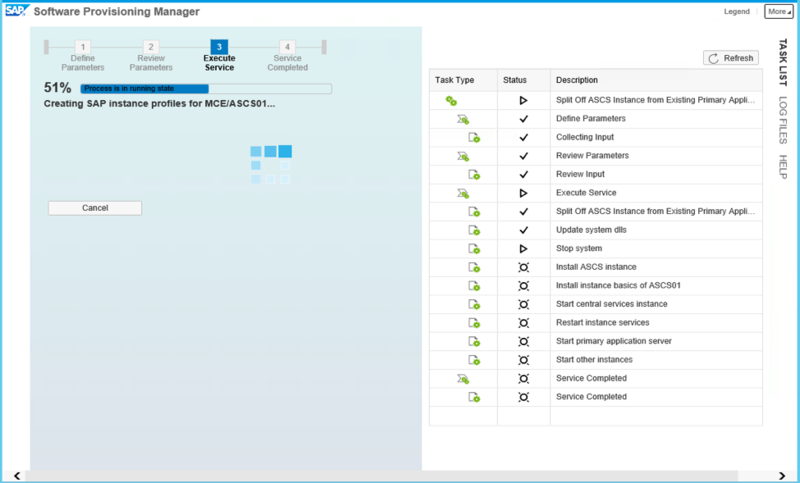 Communication between the ASCS and the SAP application provides which AAS to log onto. This ensures the system availability. 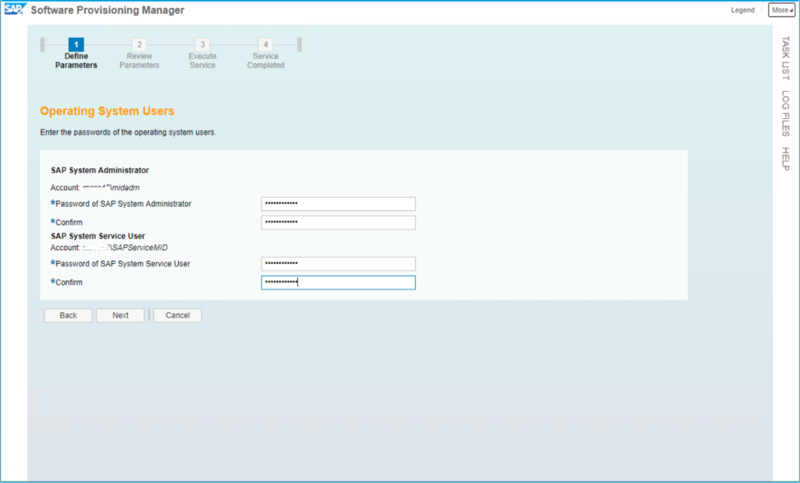 An SAP system with an ABAP central instance containing an enqueue work process can be migrated to a system with a standalone enqueue using the SAP SWPM (Software Provisioning Manager). The screenshots below are from SWPM 1.0 SP20. After downloading and extracting the ‘.sar’ file, choose sapinst from the extracted files. 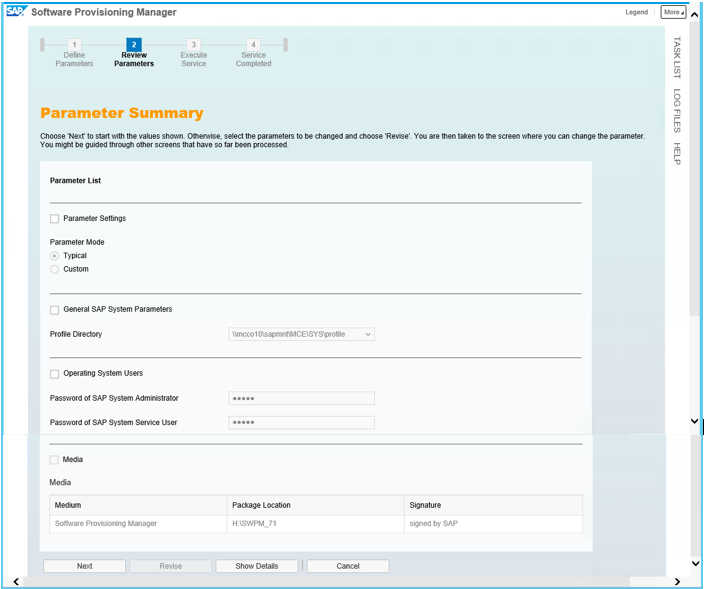 From the Welcome screen, choose ‘Software Provisioning Manager 1.0 SP20’ Þ ‘<SAP NetWeaver version>’ Þ ‘<Database>’ Þ ‘Installation’ Þ ‘Additional SAP System Instances’ Þ ‘Split Off ASCS Instance from Existing Primary Application Server instance’. Choose the mode. You can run the installation either in a typical or a custom mode. If the Typical mode is chosen, the procedure is performed with the default settings. These settings can be changed in the Parameter Summary screen, just before execution. If the Custom mode is chosen, the user chosen parameters are entered during the prompts on each screen. These can also can be changed in the Parameter Summary screen. Enter the profile directory and the destination drive. 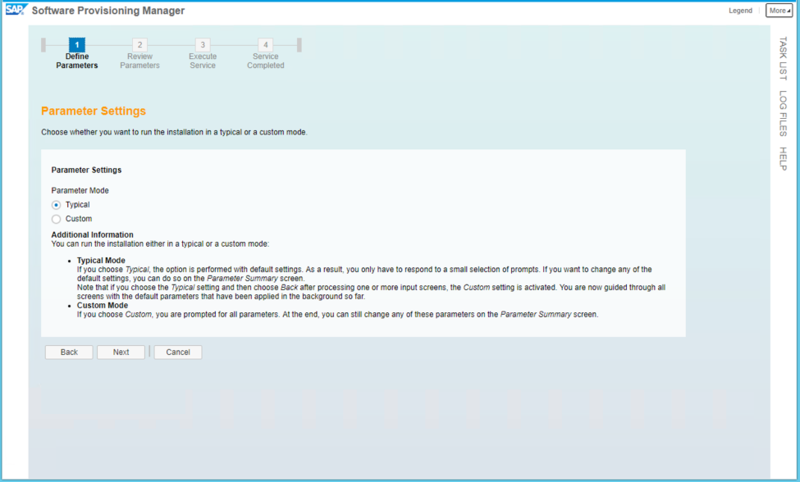 The Software Provisioning Manager retrieves parameters from the SAP system profile directory of an existing SAP system. 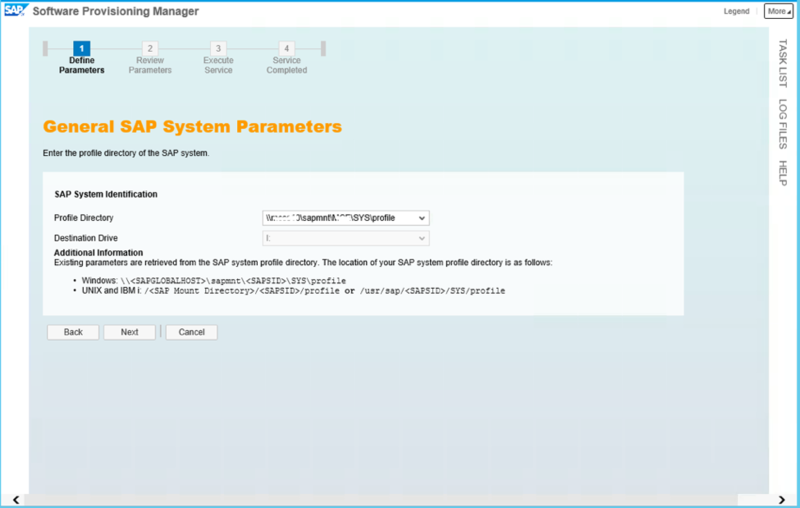 SAP profiles are operating system files that contain instance configuration information. The Software Provisioning Manager prompts you to enter the location of the profile directory. 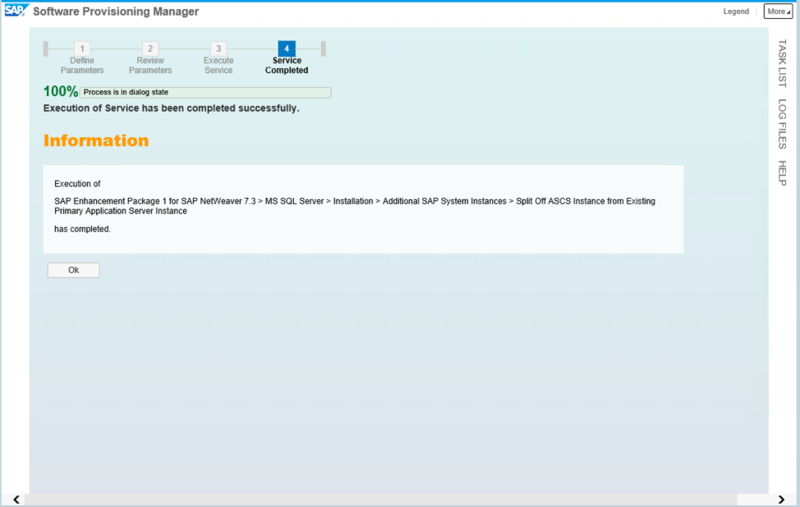 This will happen when the installation option that you execute is not the first one belonging to your SAP system installation, for example if you are performing a distributed installation or if you are installing an additional application server instance to an existing SAP system. If you are performing a distributed installation on Unix, you must have mounted the profile directory that has been created in the previous installation steps. System passwords are required. Enter the passwords for the account IDs. If the user already exists, the exact password for the user will have to be entered. Otherwise choose a new password for these users. After all of the parameters have been defined, choose ‘Next’ to start with the values shown in the Summary screen. If any of the values are to be changed, select the parameter (tick the box associated with the parameter) and then choose the ‘Revise’ button at the bottom of the screen. The screen for that parameter will be shown and the opportunity to change that parameter is presented. It’s possible that other screens will be shown through the process. Not all of the parameters are shown on the default summary screen. By choosing the ‘Show Details’ button, all of the parameters are presented and there the opportunity to change the parameters. 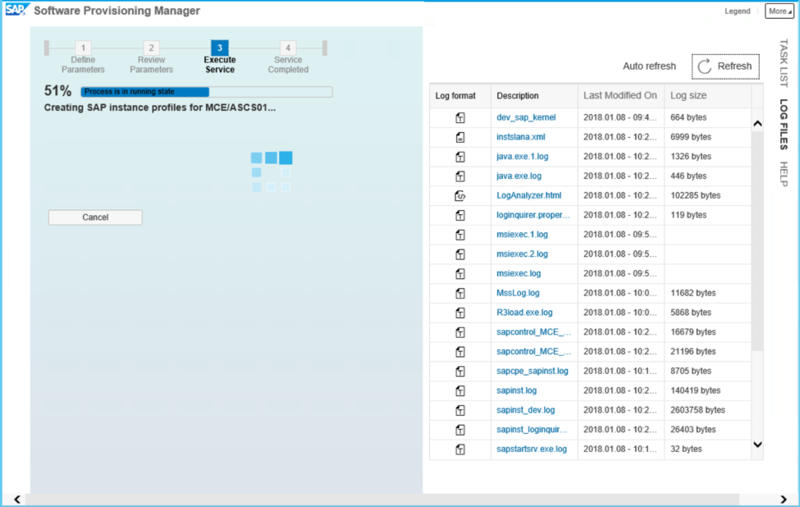 SAP has integrated the logs, the tasks and the help into the browser GUI for SWPM. The old checklist is no longer shown. Instead a progress bar with the current process is now shown. The screen below is shown when the process has completed. As can be seen, a 100% is shown and a message indicating that the process has completed. Pay close attention to the section 2.5 ‘Splitting off an ABAP Central Services Instance from an Existing Primary Application Server Instance’ and section 7.9 ‘Splitting off an ABAP Central Services Instance from an Existing Primary Application Server Instance’ and for more information on this subject. 2073500 – FAQ: Splitting off ASCS from PAS.